Special Containment Procedures: The door into the stairwell leading to SCP-3790 is to be padlocked at all times, and a single guard is to be posted nearby to ensure no individuals enter SCP-3790. By order of the Overseer Council, entry into SCP-3790 is forbidden. Description: SCP-3790 is a structure located beneath the abandoned Port Superior Canning Company warehouse in London, United Kingdom. The only access to this space is down a narrow stairwell that ends in a short black door. The door is free of identifying markings save for a small metal placard just above the door handle that reads "SCP Foundation Department of Abnormalities". The remainder of this file has been locked by order of the Overseer Council. 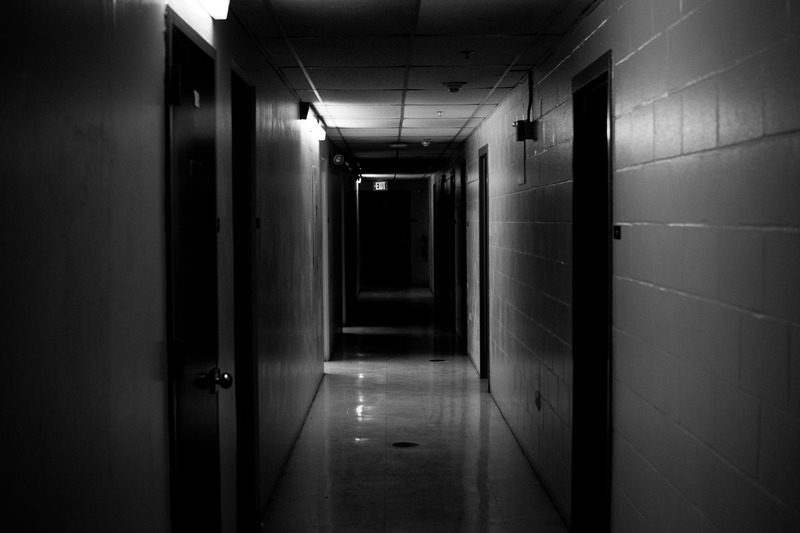 The interior of SCP-3790 consists of several descending levels, each consisting of a hallway containing four doors, two per side, and a grated freight elevator at the far end of the corridor leading to the lower levels. While there is evidence of prior human activity within SCP-3790, the structure appears to have been abandoned for a considerable amount of time. Each of the doors is a solid, heavy metal door with a sliding panel covering a small glass viewport into the dimly lit chamber beyond. The doors, some of which are rusted but otherwise undamaged, have at some point in the past had their handles and unlocking mechanisms removed, and have been welded shut. The only distinguishing marks on these doors are small metal placards located just beneath the sliding panel. These placards usually bear what is believed to be the designation for the contents of the chamber, though in some cases the placards have been removed or are damaged. The elevator has access to seven levels of the structure. No record of the SCP Foundation ever having a Department of Abnormalities exists. No information regarding the structure has been located. The following is a list of the rooms on each floor, the text on each door's placard, and a visual description of the contents of each chamber, if possible. Description: Chamber is empty aside from a violin propped in the far corner of the room. The bow is broken on the ground in front of it. Description: An ornate wooden chest with gold inlays and a large steel lock sits on a table in the middle of the chamber. A quiet clicking sound, like that of a clock, is barely audible from within the chamber. Description: Chamber is empty. Long gashes cover the walls. Pieces of bone are visible across the chamber floor. Description: A thin, pale man in a straitjacket wearing a blindfold sits in the corner of the chamber. Description: A canvas is set up in the room. A sheet is draped over it. Description: Three vaguely humanoid figures are huddled in a far corner of the room, looking away from the door. The figures can be seen shifting slightly, but due to lighting conditions within the chamber, no other details can be made out. Description: Beyond the door appears to be another dark hallway. Description: The floor of the chamber is covered with a thin layer of water. The interior of the room seems to be considerably larger than its exterior physical dimensions would allow. Description: A pedestal rests in the middle of the chamber. Four parallel lines in the dust, consistent with finger marks, imply that whatever was upon it has recently been removed. Description: A billowing, indistinct black shape is visible in the back of the room. Description: A rusted sword hangs on a rack in the back of the room. The door to the chamber feels warm. Description: A simple golden necklace hangs on a post in the back of the room, which is lit by a single tall candle. The chamber does not appear to have a floor. Description: Chamber is unlit. Individuals who look into this room feel a lingering sense of dread afterward. Description: Inside the chamber is a single, still-beating human heart suspended from the ceiling by a wire. The interior of the chamber appears distorted. Placard Name: Tool marks indicate that placard has been pried off. The word "hello" is scratched into the metal where the placard should be. Description: Sliding panel is welded shut. Description: A small, CRT television sits in the center of the room. Something is playing on the screen, but a dark cloth has been draped over the top of it. Description: A dirty twin mattress on a simple metal frame rests in the middle of the room. A figure is lying on the mattress with a sheet pulled up over them. Description: A tall, black, wooden box rests against the back wall. It is bound in chains and locks. A bright purple "W" is emblazoned on its front in gold trim. Description: A wooden chair sits in the far corner of the room. A faint shadow can be seen 'sitting' in it, which disappears upon a second viewing. Description: A layer of ice covers the viewport and obscures visibility. A dark shape can be seen in the middle of the room, although no details can be distinguished. Description: A silver lockbox rests on a table in the middle of the room. Notably, the exterior of the door is covered in scratch marks, as if by something trying to get into the chamber. Although the opening to the seventh level is visible through the grated floor of the elevator, the lift mechanism appears to have been modified and can no longer access that floor.